Vital Health Plus – Shake It Up! Have you ever found yourself falling in to an “eating rut”? You know, eating the same thing over and over again….because….you don’t have to think about it. It is fast and easy. You just don’t have time to prepare the “right ” kinds of food. I have a super Fast Food that is delicious, fast and healthy. 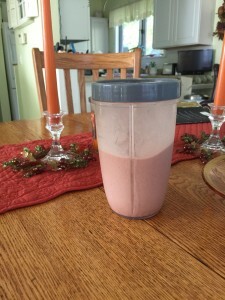 It is called Juice Plus Complete…..a delicious shake mix that is is added to your favorite plant milk, frozen or fresh fruit , and why not through in some chia seeds and fresh greens. Seriously, it is delicious, and it is all WHOLE food! Yes, WHOLE FOOD…. Non-GMO, low glycemic, and gluten-free. For more information go the “services” tab of my website….click on Juice Plus to get more information.